Our work is founded on our love for this land, but everything we do is based on science. We work with a team of local and national experts to care for our land, air, water and animals. 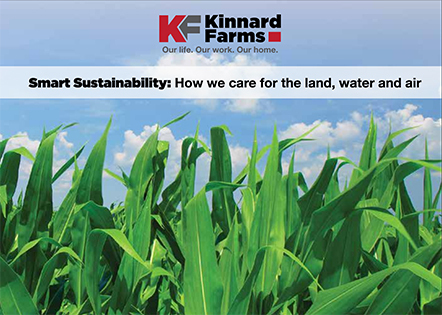 Here are just a few of the things we do on our farm to ensure the continued sustainability of our land and resources. Clean, quality water is essential to our dairy farm. We feed our cows clean water to produce quality milk, and we recycle 100% of the water on our farm. Our Comprehensive Manure Management Plan requires us to record and collect all the water on our farm, including rainwater. We work hard to develop recycling plans customized to our farm, and work with government agencies to follow some of the strictest regulations in agriculture. Because we farm on karst topography, we use state-of-the-art technology to apply fertilizer to enrich the soil. Our Versis machine scans for geological information, plots where the karst is, and creates maps of where nutrients will and will not be applied. We only apply nutrients where they are needed, and only the necessary amount. At the end of the day, farming is the art of maintaining a complex cyclical balance of nutrients in and out of the farm. We work hard to keep the system in balance and are committed to ensuring this land stays healthy for future generations.